After graduating from the Music Department of the University of British Columbia in 1953, Dr. H. Colin Slim enrolled in the graduate program at Harvard University and taught music at the University of Chicago, 1959-1965, and University of California,Irvine, 1965-1994. He has published extensively in the music field. The development of his Stravinsky Collection is explained in his Annotated Catalogue of the H. Colin Slim Stravinsky Collection, pp. 3-15. The collection consists of more than 250 items documenting the work and life of composer Igor Fyodorovich Stravinsky (1882-1971) including autographed letters, postcards, musical quotations, miniature manuscripts, photographs, programs and other printed material. There are items relating to Stravinsky's performances in Vancouver in 1952 and 1965. 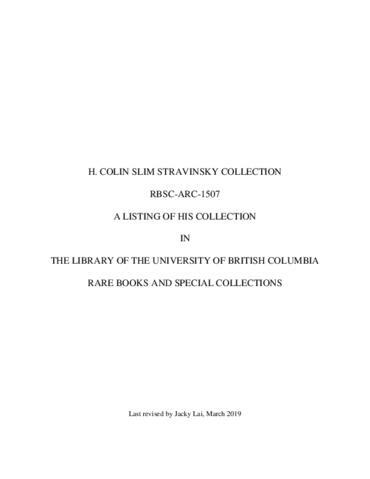 The items are listed in the Annotated Catalogue of the H. Colin Slim Stravinsky Collection, available in the UBC Library (ML 134 S96 S54 2002). A selection of them can be viewed online. Donated by Dr. H. Colin Slim, 1999. The items in the 2017 accrual to the collection have been inserted into the chronological order. This collection was rehoused in 2015 and box numbers have been updated. Inventory with original box numbers is available upon request. Finding aid and inventory updated by Andréa Tarnawsky in January 2018.